Post #200 & My First Giveaway! I'll spare you the sappy talk about how, when I started this blog almost a year ago, I was too embarrassed for anyone to read it, and how much I've grown as a cook and photographer since then. What I will say is how grateful I am to have finally found a hobby that makes me smile, that gives me something to look forward to every day, and best of all, that has allowed me to connect with new friends. In honor of this, my 200th post, I'm hosting a giveaway that I think is very much in the spirit of my blog. It's not a fancy new kitchen gadget, or even a brand new cookbook. 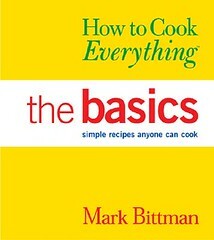 It's my copy of How to Cook Everything: the Basics by Mark Bittman (you know he's my fave). This little abridged "the Basics" version of HTCE was there with me through my very first experiments in the kitchen and was my trusty guide until I got a copy of the full book. It's not in perfect condition, but it's been well-loved, and I don't use it anymore, so I want to pass it on to someone out there as a little thank you for reading. To enter: Leave a comment on this post. You can say anything, tell me who you are, where you're from, what you like to cook, how you found Playing House, or just say hi! Even if you don't want to enter the giveaway, I'd still love to hear from you. Seriously, it makes my day every time a comment pops up, so this is my passive-aggresive way of getting you to talk to me. A week from now, next Friday (June 6th) at 6 pm, I'll use a random number generator to pick a winner! Hello, Amy! I'm a friend of the excellent Jason Willensky. Very nice to see you share his love of food (one of our common interests). OK don't enter me in the giveaway b/c i can't cook ANYTHING but HI! Hello, Amy! Happy anniversary on your blog... right? I'm jealous you live in the pacific northwest. I lived in California (SF) for eight years and miss it. But I went on a trip through Oregon to Washington and loved every minute of it. GORGEOUS! Oh..and I'm still learning to cook and be creative with recipes. Now I figure I should get the basics down pat and later experiment. Congrats on #200! I love your blog so keep it up! Found you through Stinkerpants.com (I think?) and LOVE your blog! I love your blog! I am also from the PNW- great photos, congrats on your 200th post! Congratulations! I'm so glad I stumbled upon your blog a few weeks ago! I'm not quite sure how I found your blog, but I sure enjoy it!! Congrats on #200! Congrats on 200 posts Amy!! Your blog is so awesome, I'm so glad we got matched up with each other for "adopt a blogger" and got to know each other! I just found your site a couple weeks ago, but it made it on my Google Reader! I love to cook, and really enjoy your site! Hey Amy!! Yay for 200 blogs! You are very much an inspiration to someone like me starting a blog about a hobby. Your photos are great. hope to be that good someday soon! if I don't win that book, I'm still gonna go out and buy it! Looks good. Congrats on the milestone and thanks for the chance to win this. Congratulations on your 200th post. I came across your blog by accident and love its nuggets of inspiration and food for thought. I like the way you share the creativity on other blogs too. Congrats, Amy! You and your blog are so very lovely. It's so nice to get a little piece of you almost everyday! I found you from your chocolate cake picture--it was up on the serious eats photoblog. Beautiful pictures! Amy, I came to your blog after you posted on mine, and I cannot stop reading yours!! I think I am in love with every recipe I have read so far! I am a berry fan as well, and I am trying to navigate my way through the kitchen and have fun doing it, so I can totally relate to your blog!! great job!! Yay for your first giveaway! I've been eying this book for awhile--and I've been trying to get the huz involved in the cooking more often, so I'm keeping my fingers crossed for a win! Hi Amy! Thanks for the comment on my CEiMB post. I checked out your blog and love it! I love to cook and can't wait to get better about posting / taking pictures, etc. Hmm, I wonder why I haven't been reading your blog. I'm adding you to my reader right away! I've recently found your blog and I love it! Keep up the great work!